32 Comments	This post may contain affiliate links. 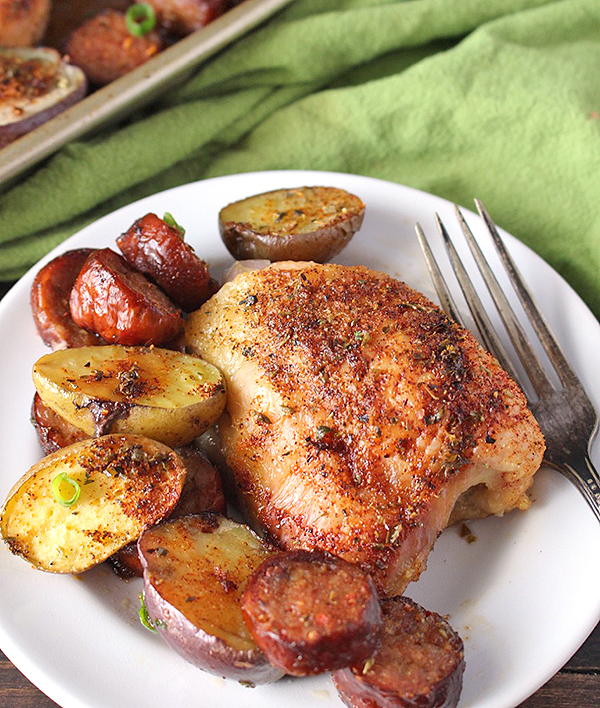 This Paleo Whole30 Spanish Chicken is baked on one pan, is super easy and so flavorful! Gluten free, dairy free and a meal the whole family will love. Chicken thighs are something I cook every weekend to have to eat all week. I usually go with favorites like Lemon Butter Chicken, Pizza Chicken, or Roasted Chicken with Olives and Figs. Sometimes just salt and pepper if I’m feeling extra lazy 🙂 But when I saw this recipe on Pinterest I knew I wanted to make it and it is so so good! 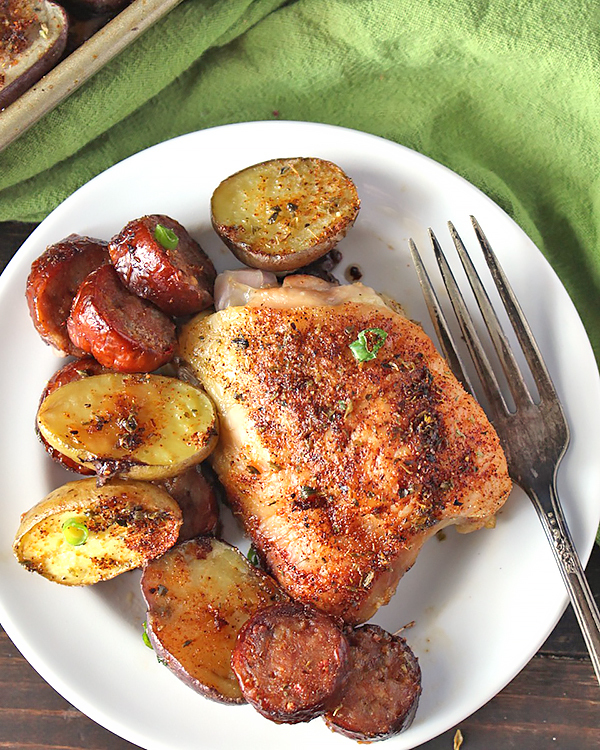 The chicken is flavorful and juicy, the sausage gets a little but crispy, and the potatoes get tender on the inside and crispy on the outside. It’s such a perfect meal with balanced flavors and textures. I love that it is so easy to make and everything is cooked on one pan so cleanup is super easy. Even the prep is quick- just cutting the baby potatoes in half and slicing the sausage. It comes together so quick and in the oven in no time at all. I like using avocado oil because it is very mild in flavor and has a high smoke point. That means I don’t worry at all that this is cooked at 400°- I know it will produce crispy food without burning it. I like to order mine through Thrive Market because it’s always the best price. The andouille sausage adds a great bold flavor that is so delicious. My husband went on and on how much he loved that paired with the potatoes and chicken. It definitely is a star ingredient here. I found a Whole30 compliant brand at Whole Foods- just be sure to read the ingredients to make sure there isn’t any added sugar. 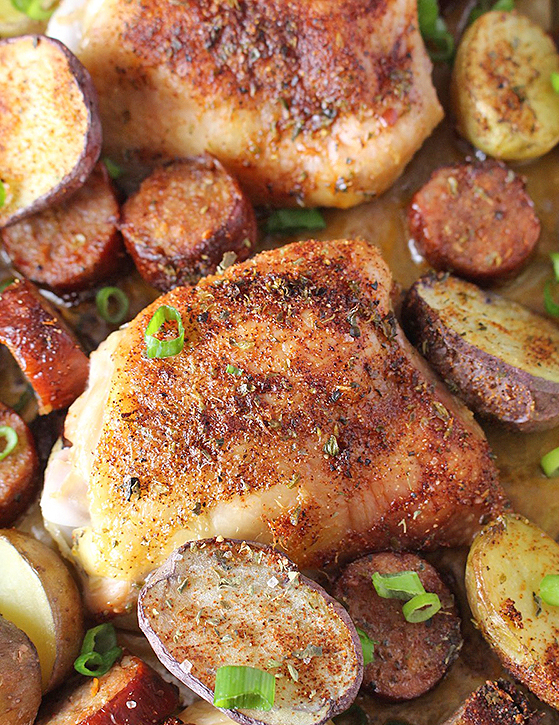 You will love this one pan meal! It comes together so fast and even the leftovers are delicious! CLICK HERE for all my Whole30 recipes. Preheat the oven to 400° and line a sheet tray with parchment paper. 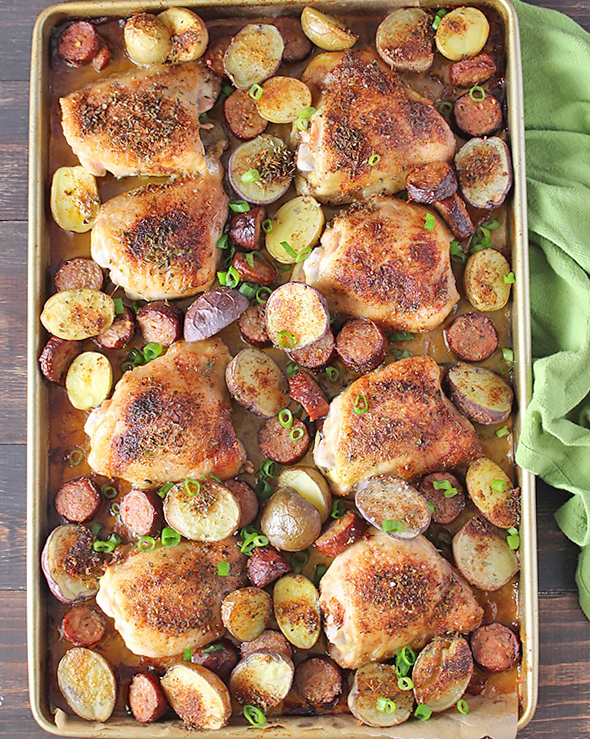 Place chicken thighs on the sheet tray then spread the sausage a potatoes around them as evenly as possible. In a small bowl, combine oregano, paprika, garlic powder, salt, black pepper, and lemon zest. Drizzle the avocado oil over the chicken, sausage, and potatoes then sprinkle on the seasoning mixture. 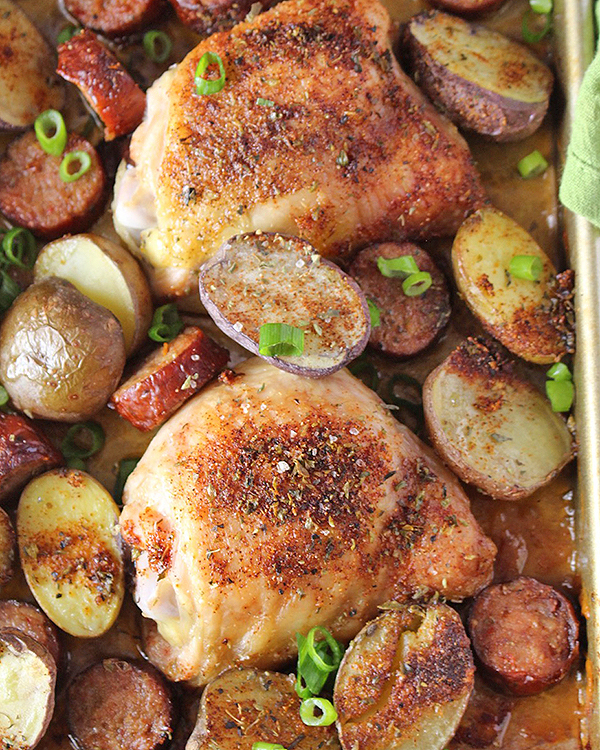 Bake for 40 minutes- until chicken is crispy and potatoes are tender. Pace chicken thighs on the sheet tray then spread the sausage a potatoes around them as evenly as possible. Not a big chicken THIGH fan but I do love my chicken. And I love the spanish twist on a seemingly traditional “meat and potatoes” kind of meal. Gotta try this one! Thanks, Ashley! The flavors are so good! I’m sure it would be good on breasts as well. if I sub with chicken sausage & russet potatoes, and my thighs are skinless… will the cooking time be the same? Hi Lois- skinless thighs shouldn’t make much of a difference unless they’re boneless and then it would be much less cooking. Just cut the potatoes in about 1 1/2 inch chunks (as best as possible). Hope that helps and you love it!